Now make your fiber broadband fully symmetrical for only $10 more a month. Gamers: send bullets as fast as they are coming at you. Creators: upload your videos and photos in seconds instead of hours. Everyone: Back up your precious data and hard drives to the cloud. Could utilize thy fearful symmetry? As more and more customers work remotely from home, and even regular folks upload fearful amounts of data in the form of home movies, pictures and online back ups, the need for higher upload speeds has increased dramatically over the past couple of years. Customers have recently been asking for higher upload speeds, and we have heard you. We are pleased to announce that our fiber to the home customers can now choose fully symmetrical broadband speeds! 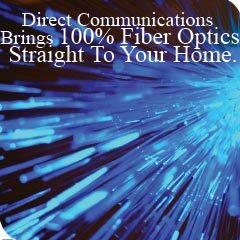 Our network is state-of-the-art fiber optic cable. Starting Jan 2015, Eagle Mountain fiber customers can now Amp Up any broadband package to full symmetry for just $10 more per month. So, for example, if you are currently paying $59.95 for 30Mb down with 5Mb up, you can Amp Up to 30Mb down with 30Mb up for $10 more, so your new total would be $69.95 for 30/30 speeds. Customers who really want to create havoc online can now even choose any upload speed up to 100Mb upload, and download speeds up to 1GB. In the past, upload speeds were limited by two major things: the engineering specs associated with ADSL, which didn’t allow much more than 1Mb upload, and NECA (national exchange carrier association) federal regulatory specs that put limits on our upload offerings. I recently asked a prominent local telecommunications engineer about this at lunch, who explained how this situation came to be. For some reason which we in marketing will never be able to understand, when the engineers who designed the electronics that power the internet put together their specs for DSL routers and servers, they decided that people did not need as much upload as download speed. They presumed that the regular folks would always be pulling more data from big content providers than pushing it back to the cloud. That assumption went into all the manufacturing specs and for years most network electronics were built that way, until it became impossible to mass produce or order electronics that could handle symmetrical speeds. It was almost like a VHS versus BETA situation, where the inferior product ended up being the one that was mass produced and became the standard. Upload is still more expensive than download, and probably always will be, but the good news is that fiber overcomes most of the upload technical limitations. The electronics that deliver ethernet over fiber have thankfully been designed to deliver fully symmetrical speeds to commercial customers, and residential customers are now the lucky beneficiaries of that forward thinking. The second obstacle was the NECA tariffs, which dictated to federally-supported local exchange carriers (small telcos) like us, how much we had to charge for each megabit of speed, and how many megabits we were allowed to deliver for download and upload. We had been begging them for years to give us more options, so that we could be more competitive. Thankfully, NECA has recently become a lot more forward-thinking, and given us more room to offer better upload speeds, which has opened up the path for new symmetrical speeds on fiber. Unfortunately, the technical limitations on copper remain, largely due to the equipment design. VDSL gives us slightly better capabilities for customers still on copper, but sadly still not much more than 2Mb currently. There are a couple of options with copper—we could try do an entire network upgrade and replace all of the current VDSL equipment with some newer electronics that could possibly raise the upload speed. This would require hundred of thousands, even millions, of dollars. There are other creative engineering solutions like bonding several pairs of copper together, where available in a neighborhood, to deliver ethernet over copper, but that has a limited range anyway, and also requires new electronics on each end which would cost each customer several thousand dollars. Ben Hayes, our commercial accounts manager, has been assigned to work individually with copper customers who are looking for higher upload speeds, and would work with the engineers to find these unique customized solutions. This would be a premium service though. 2Mb upload is still our regular limit for VDSL- that is what we are comfortable advertising. One other option copper customers will have is to use the new Wi-Fi network we are building out to blanket Eagle Mountain for upload purposes. All broadband customers will have free access to this network for at least one device, with the option of adding as many devices as you like. Your upload speeds on this wireless network will only be limited by your device’s radio capabilities, and the available bandwidth on the tower, since it, like all wireless service, will be shared bandwidth. However, it will not be a secure network—it’s wireless, so if you are worried about uploading sensitive private data, this option may not appeal to you anyway. The only real solution, and the current operating plan, is simply to replace all copper lines with fiber to the home, because we would rather put our investment into fiber construction than replacing our VDSL equipment. Only fiber will be able to get us all to fully symmetrical speeds over the long run, and by full symmetrical we mean speeds like 100 down and 100 up. We will convert the entire city to fiber as quickly as we can. Our crews are working around the clock to replace the copper with fiber optic cable to each home. To make your speeds symmetrical today, call our office at 801 789 2800. When is the Saddleback subdivision getting fiber?? ?